March 10, 2016 – Just weeks before the historic encounter of comet C/2013 A1 (Siding Spring) with Mars in October 2014, NASA’s Mars Atmosphere and Volatile Evolution (MAVEN) spacecraft entered orbit around the Red Planet. To protect sensitive equipment aboard MAVEN from possible harm, some instruments were turned off during the flyby; the same was done for other Mars orbiters. But a few instruments, including MAVEN’s magnetometer, remained on, conducting observations from a front-row seat during the comet’s remarkably close flyby. Unlike Earth, Mars isn’t shielded by a strong magnetosphere generated within the planet. The atmosphere of Mars offers some protection, however, by redirecting the solar wind around the planet, like a rock diverting the flow of water in a creek. This happens because at very high altitudes Mars’ atmosphere is made up of plasma – a layer of electrically charged particles and gas molecules. Charged particles in the solar wind interact with this plasma, and the mingling and moving around of all these charges produces currents. Just like currents in simple electrical circuits, these moving charges induce a magnetic field, which, in Mars’ case, is quite weak. Comet Siding Spring is also surrounded by a magnetic field. This results from the solar wind interacting with the plasma generated in the coma – the envelope of gas flowing from a comet’s nucleus as it is heated by the sun. 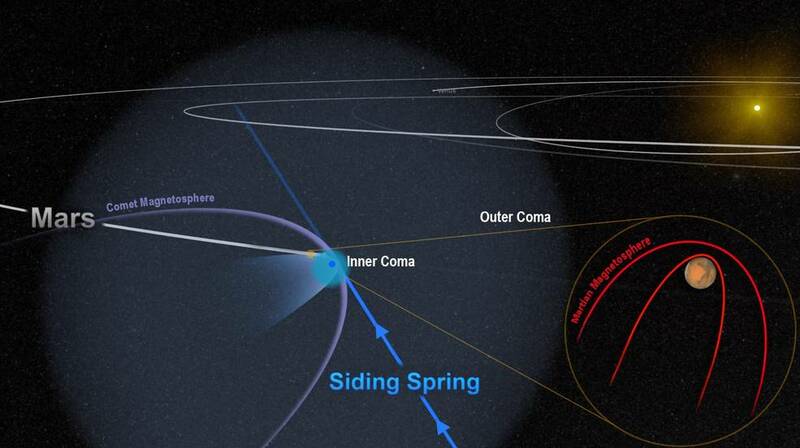 Comet Siding Spring’s nucleus – a nugget of ice and rock measuring no more than half a kilometer (about 1/3 mile) – is small, but the coma is expansive, stretching out a million kilometers (more than 600,000 miles) in every direction. The densest part of the coma – the inner region near the nucleus – is the part of a comet that’s visible to telescopes and cameras as a big fuzzy ball. When comet Siding Spring passed Mars, the two bodies came within about 140,000 kilometers (roughly 87,000 miles) of each other. The comet’s coma washed over the planet for several hours, with the dense inner coma reaching, or nearly reaching, the surface. Mars was flooded with an invisible tide of charged particles from the coma, and the powerful magnetic field around the comet temporarily merged with – and overwhelmed – the planet’s own weak one. At first, the changes were subtle. As Mars’ magnetosphere, which is normally draped neatly over the planet, started to react to the comet’s approach, some regions began to realign to point in different directions. With the comet’s advance, these effects built in intensity, almost making the planet’s magnetic field flap like a curtain in the wind. By the time of closest approach – when the plasma from the comet was densest – Mars’ magnetic field was in complete chaos. Even hours after the comet’s departure, some disruption continued to be measured. Espley and colleagues think the effects of the plasma tide were similar to those of a strong but short-lived solar storm. And like a solar storm, the comet’s close passage likely fueled a temporary surge in the amount of gas escaping from Mars’ upper atmosphere. Over time, those storms took their toll on the atmosphere.